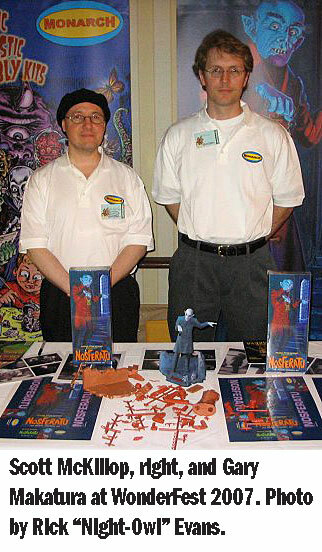 As 2006 drew to an end, the future of the plastic figure model kit looked grim. Polar Lights was out of business and the established model companies didn’t seem to have any interest in figure kits. Then, in the middle of a thread at the Clubhouse’s “Styrene Dreams” forum, Jeff Yagher advised members to keep an eye out for Monarch Models. I decided not to wait for news, but asked Jeff if he could put me in touch with the guy behind the company. He electronically introduced me to Scott McKillop, who was happy to talk about what he was up to. I wrote a news story that ran in my “Resin the Barbarian” blog during the holiday season, then I sat back and awaited updates from Scott. A few weeks later, Frank Winspur of Doll & Hobby Shop exploded back onto the kit scene with Moebius Models, which he was launching with a repop of the long-missed Aurora Dr. Jekyll as Mr. Hyde, and following that up with a lot more. I was excited, but also concerned about what this apparent competition might mean. Scott, though, was just as happy as anyone. Seems like a good time to get an update about where he’s heading with his new company. Resin the Barbarian: What’s your current expectation for when the first 2,000 Nosferatu kits will reach North America? Scott: The Nossy kit should be in North America by the end of July. Gary is working on the instruction sheet and the second test shot has some tiny part fit errors being corrected as we speak. RtB: Do you have a sense of how well the kit will sell? Does the potential for distribution look promising? I know a number of online dealers are offering presales. Scott: The pre-order sales of Nossy are excellent. The last big distributor bought the last 404 kits. The first run of 2000 has been sold out (by Stevens Int., Hobbytyme, and Squadron). If a person hasn’t already preordered one, they had better hope their local hobby shop is on the phone to the above distributors. RtB: Are you going to have more of the Nosferatu kits made? Scott: Another run of Nossys would be based on market demand. I want the kit to remain highly collectible by keeping the production numbers small. At the same time I want everyone who wants one, to be able to find one without having to resort to hijacked prices on eBay. Tricky balance. Once I open up the Monarch Club, the members will have a big say in what happens. Scott: WonderFest was awesome and I had to chance to put faces to bulletin board names. Everyone was very nice to meet and it was good for the business. RtB: What other shows do you plan to attend? Scott: ihobby expo for 2007. Back to Wonderfest in ’08 and maybe the tabletop expo in Las Vegas (but it is the weekend following WonderFest and that’s a lot of travelling). RtB: What age group do you expect Monarch’s products to appeal to? I’m guessing middle-aged men but I’d like to see kids such as those featured in your ads get excited about them. Scott: I have no doubt that my target audience is younger middle-age men such as myself, 40-55, but it is certainly my dream to have the younger kids discover the hobby. This is why Gary’s artwork for the boxes is so important. It was the artwork that hooked me in the early 1970s. We shall see. RtB: Speaking of ads: Your first teaser poster and the comic-panel advertisement in the current issues of Amazing Figure Modeler and Kitbuilders feature a blond boy (named Jack, I believe? ), as well as a friend and family members. Is that boy based on someone in particular? Scott: The “boy” is Jack Q. Public, Anytown, USA. Based loosely on myself, on all modelers. We started into this hobby as kids and that’s the fun and the memories brought back when modeling monster or sci-fi kits. 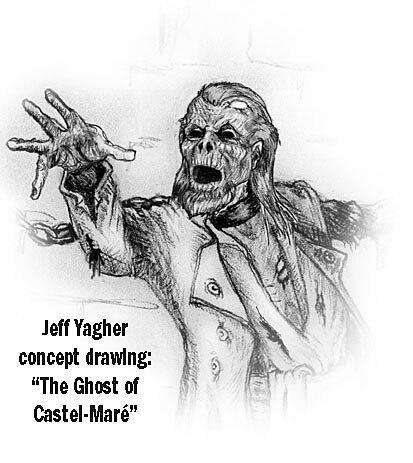 RtB: What’s the story behind the Ghost of Castel-Maré? What will he look like, and when will he be available? Will he be 1/8 scale? Scott: That was an early conversation regarding one of Gary’s ideas. The Ghost. I wasn’t too sure of his original concept and Gary mentioned a play on the Castel-Maré character, and I was sold. The scale will match the original prisoner. We are working to meet the end of 2007 deadline on him. His appearance is so scary that Jeff Yagher has to sculpt it blindfolded, working only during daylight hours, curtains up, and his wife in the house within earshot. RtB: Are the Ghost and the Forgotten Prisoner supposed to be the same character? Scott: Yes, the Ghost is the ghost of the Prisoner of Castel-Maré. I asked Jeff to use the prisoner’s skull and bones to guide him on reconstructing the ghost’s facial features. “CSI” meets Monarch. 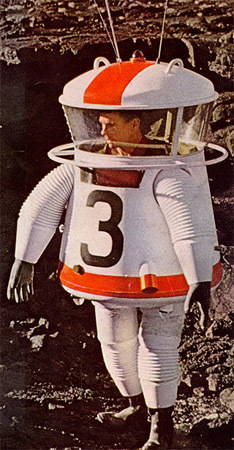 RtB: Is the Moon Suit the sci-fi kit you mentioned when you did the first Q&A with me last year? If so, who’s going to sculpt that one, and when will it be available? Scott: Yes, the Moon Suit is the first sci-fi kit that I “teased” about last year. Again we are aiming for the 2007 deadline. Because of the machined parts, Jeff Y. and Tony Cipriano, had to turn it down. It will be a Made in China solution. Likely 1/10 scale. Presented in the wide long box format. While technically not a fictional item, it never made it into space, yet spawned the toy suit for Major Matt Mason. It kinda acts as a crossover kit for space history buffs, sci-i guys, and MMM fans (I hope). RtB: What other original kits are in the works from Monarch? Anything that will require a license? Any vehicles or other non-figure kits? Scott: The other original kits in the works are top secret. 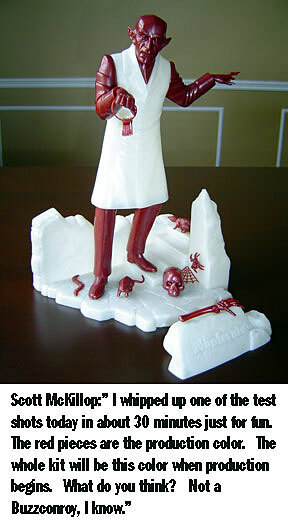 But new sculpts will be the rule at Monarch. Reissues would be the exception. All things are pending licensing agreements. Kit No. 4 marks the beginning of licensed properties. Of this kit, I can tell you that it is a licensed property of a para-military character. Original. Vehicles: That’s a tough one because Frank (of Moebius) has that nicely sewn up Non-figure?!?!?! Todd are you crazy or just tired? RtB: What’s the potential for glow-in-the-dark parts? Scott: Glow-in-the-dark, parts? Hmmm, well I did grow up in the ‘70s and glow kits were the only thing that I knew, so … we’ll see. Looks like Frank received a hero’s homecoming for his glow Jekyll, that’s a good sign. I got five of his glow Jekylls at the show. RtB: What do you think about the resin replacement part market that has sprung up? Do you plan to offer any resin parts in your styrene kits? Scott: I love the idea of the resin replacement parts market. I won’t offer resin parts for my kits, but I would be quite happy if someone out there did make a go of it. RtB: Since we first spoke, some other “players” in the kit field have come to light, particularly Moebius Models and supposedly a new Aurora Plastics Corp. Considering that both of these companies plan to repop a number of Aurora kits, has your thinking on reviving any of the old kits changed? Do you still want to produce any of the Aurora classics? Scott: Definitely the appearance of Frank’s company has helped everyone, including me. I can’t do everything and neither can Frank. But with both companies maybe modelers will have the best selection of new and repopped kits. Frank’s a great guy and we have a very good gentleman’s agreement of not trying to compete for the sake of competing. His standards ensure that I keep my standards high, and vice versa. How can you lose? I had planned on repopping Dr J., but now I can spend those tooling dollars on the Ghost. I would like to repop certain Aurora kits, but again this will depend on Frank’s releases and licensing agreements. Believe me, there is certainly no shortage of great new ideas out there. RtB: If the answer to that is “Yes,” which kits do you want to bring back? RtB: If I don’t ask specifically about Big Frankie, someone will ask me why. So, what do you think? Any interest in putting that Monster back on the table? Scott: Gigantic Frankenstein is always on the table but at this time I need to learn how big my market is and how profitable figure kits can be. I would never say “no”, but the fact that Polar Lights wanted to do it, and chose not to, despite their strong history, is reason to be careful. But honestly, it always remains on the table. Frank and I have talked about it, because I know it is on his wish list too. Time and money, of course. RtB: Any chance Monarch would do a “missing pieces” kit? Kind of like the old Customizing kits but with parts that seem always missing on a lot of vintage original kits. Examples: Badge for U.S. Marshal, shotgun for Jesse James, sword blade for Spartacus, scabbard for Zorro, lantern for Blackbeard, sword blade for Captain Kidd, chain links for Big Frankie, palm tree pieces for King Kong, axe for Viking, web section for Spider-Man. Scott: Interesting idea. Not one that I would have ever thought of doing. I don’t really know how serious the potential of seeing that “kit” come to light is, at the moment. But again, all ideas are put in the bag for future consideration. RtB: What have been the high points so far in your effort to start up Monarch? Scott: The biggest high point is the mind-boggling power of the Internet. I have not had to set foot outside of my house to accomplish 98 percent of what has been done. I have never met Jeff Y. or Gary (prior to WonderFest) and I have never been to China (although it would speed up development if I did go). This whole Nosferatu project has been surprisingly easy to accomplish. And with the experience gained, the Ghost and the Moon Suit should be faster to market. RtB: What have been the low points? Scott: Believe it or not, the low points have been so minor that it isn’t worth mentioning. And now that the test shot is in my hands and Frank’s Dr. Jekyll is in the stores, my motivation has steamrolled any unforeseen obstacles. RtB: Are you glad you’ve taken the steps you have, and do you plan to keep going? Scott:I am very glad with what has been developed. We have let the $ flow pretty easily with Nossy. The next two kits will be developed on a rigorous budget to follow the actual costs versus revenue. This will help determine how profitable a figure model kit company can be. I have no plans to stop until it is quite apparent that I am flushing money down the toilet repeatedly. But like I said before, I am willing to pony up and lose a year’s salary before I throw in the towel. Based on what I have seen to date, the future looks very bright for a small niche company such as Monarch. And Moebius, too. The Golem, Dr Caligari, London after Midnight, Metropolis: possibly but not in the next year or two. Edison Frankenstein: I’d have to look that one up. But it has an interesting ring to it. The Phantom of the Opera: No to an Aurora repop. New sculpt maybe. It comes with the whole Universal monsters licensing package. Aurora Blackbeard and Capt. Kidd: I like the sound of those repops. MoM Creature: I like the sound of that one too. Pirates of the Caribbean: I wonder what Disney’s licensing fee would be? Generic pirates: possibly what with the popularity of the new movies but who would buy and build it? We shall see how are Ghost of Castel-Maré kit sells first. 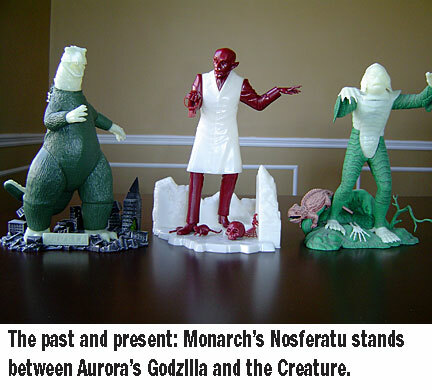 Aurora’s unproduced Godzilla: I like it. Curse of the Werewolf: Maybe, but currently lower priority. Mole people: Maybe but more likely. Morlocks: I like it. I really liked the movie. Glenn Strange Frankie: I would have to look into that one. The Fly: Ah the Fly, the pretty pretty Fly, the one that started it all for Monarch … My dream come true. I would love to do the Fly. Ymir: Another dream kit. Why has no one done this before? Is there a licensing issue? Cheech and Chong: Hmmmm I am not really sure how well that would sell. Coppola Dracula: Tough one, I am not too confident in its sales. Dinosaurs: Only if it is designed by Steve Ross in the PS style. Langella Drac: I don’t know what that version is, worth checking it out. Aurora prototypes: Maybe, depends on the specific kit. Silver Age DC heroes: Tough one because I only knew the Bronze age, and I always thought the “pre Bronze” age art was too stiff. Plus the licensing. Super heroes: I would love to do them based on the ease of licensing. I am a Bronze age guy. Maybe once Monarch has earned a good reputation it will be easier. Phantom Cruiser: I would have to look that one up. Space Ghost: Same thing as above. Lone Ranger: Seems that the Comics Scenes version is almost free on eBay. It doesn’t command a very big price. And with a reproduction box from David Vaughn, you’re all set. Classic sci-fi vehicles: Oh there is something I have in mind, there is so much to be exhausted from the public domain. In fact I do not think a person can exhaust the public domain. That’s the beauty of it. This Island Earth Mutant: He comes included in the Universal Monster Licensing group. We will see. But I like it. The Mole Man: Same as above and Gary has already done the box art, so we will see. Gort (or Gnut): 20th Century Fox. Sticky people at Fox, haven’t seen the Fly yet in plastic either. I like it, though. Original Mary Shelley Frankenstein: I do like the public domain. But would a literary interpretation sell like our silver screen favorite? Hmmm, between Jeff’s sculpting skills and Gary’s box art, it just might be a seller. HG Wells: We would like to think of it, but Frank is likely to have something to show for it, before we get around to it. Jules Verne: Same as above. Hammer Films: Hmmm, I would have to look into that, would they sell as well as the Universal characters? Rondo Hatton: I would have to look into that one. I don’t know the character. Werewolf of London: Jeff Y. thinks that one is a good idea too. It might be public domain. Frankie meets Wolfie: Hmmm. Well it would be covered under the Universal Classic Monsters Licensing package. It is possible. Aurora UNCLE: I like the concept. Maybe the new Aurora guys will do it first. Wacky Racers Cars: I will do any kit that has fangs, claws, and a few bones and spiders scattered on the base. After that, I get out of my league. Besides, I thought car kits and firecrackers were meant for each other. Jonny Quest: Haven’t given him too much thought because cartoon characters always look like toys when they are made into models. More things to come: There are many more things that we have planned that come from the wonderful world of public domain (P.D). Jeff has a pet project idea for one Public Domain kit. I have already come up with a name for the series of sci-fi P.D. kits, that I would like to do. We are working on something in the parody exemption line thanks to a friend at New Line. In general, the goal at Monarch is to offer original sculpts concentrating on figure kits (Monster, Sci Fi, Hero, Fantasy). There are some Aurora repops on our list, but not many, and that may shrink, depending on what Frank, and the new Aurora people produce. There is a healthy 50:50 mix of public domain and licensed characters on our wish list. The wish list will change based on sales and licensing ease. If a public domain character commands as much retail return as a licensed character, then why pay for all the licensing hassle? We will follow the market, but at the same time try to steer the market in the direction of our products. Jeff Yagher, Gary Makatura, and I are big-time Aurora monster model fans, and we are listening to the GK world for ideas and to the BBs for ideas. There is no shortage of ideas, but there is a shortage of time and a limit on money. But hopefully between Frank’s work at Moebius and my work here at Monarch, all modelers will have plenty of reason to celebrate over the next several years. 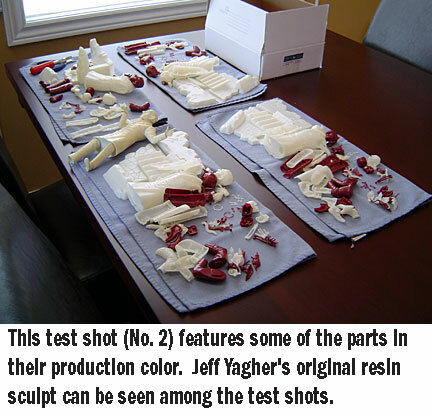 This article was posted in Monsters, Producers, Styrene plastic and tagged Monarch Models. Bookmark the permalink. Follow comments with the RSS feed for this post. Both comments and trackbacks are closed.